Yes, you read that right; the Gods have spoken. According to McKinsey, it’s possible to get 40% more from a portfolio by engaging in one rather simple activity. Now anyone who’s read my blog before will be used to me banging on about prioritizing your project portfolio, but McKinsey? I mean, they’re C-suite heavyweights! So prioritization is key to getting the most out of your portfolio of projects – great. But McKinsey wasn’t looking at the kinds of projects we normally talk about in this forum. They were looking at resource allocation across the whole company. This is like project portfolio management amplified, with stakes way higher, and budgets way bigger than most of us ever dream of. Most organizations take a “let’s just do what we did last year again…” approach to managing their corporate resource allocation. The portfolio really doesn’t change very much over time. What McKinsey’s research has shown is that organizations that actively manage their resource allocation - their portfolio of businesses and the initiatives in which they engage - outperform their more static competitors by a massive 40%! I haven’t had the pleasure of quizzing the folks who did the research, but we can guess why this might be. First of all, an organization willing to ask questions and to take the risks associated with re-jigging their business is probably a more progressive and open organization in the first place. Finally, the act of asking these questions encourages everyone to spend just a little time thinking about what’s important. Reflecting on why you’re there, what you’re there to achieve, has a wonderful effect; it helps you focus on what’s important and stop doing things that are slowing you down. Each of these points has a direct analogue in the project prioritization process. Organizations that actively align the project portfolio with strategy are probably just “higher performance” organizations in the first place. Being able to clearly articulate priorities helps pick projects from the existing pool of request, but it also helps departments / project sponsors come up with “better projects” to work with. And finally, the process of setting out corporate priorities and throwing back projects that aren’t aligned encourages managers to reflect on what they are doing and to focus on strategic alignment. We have a saying in England; what’s food for the goose (female goose) is food for the gander (male goose). It simply means, what’s good for one person is also good for someone else. What’s that got to do with McKinsey’s research? Well, I’ve talked before about how improving the project prioritization process can help your career as a PMO. It turns out that the same is true for CEOs. CEOs who actively manage their strategic portfolio are dramatically less-likely to be fired from their jobs than those who don’t. (A little side-note: I find it curious that McKinsey’s “measure of success” for these CEOs is that they didn’t get fired). 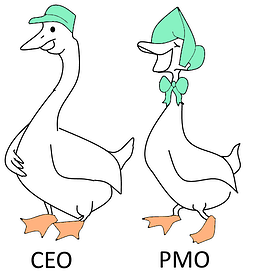 So what’s good for the PMO – active allocation of the resources at your command based on strong value-based prioritization – is also good for the CEO. Perhaps if you share this observation with your executive team, they might be more open to supporting change in the way you do prioritization. And to help you get started, I've created this infographic to communicate how to safely transform the project prioritization process. You can even use it to track your progress; just check off items as you go. Anyone interested in reading the orginal McKinsey article can see it here.